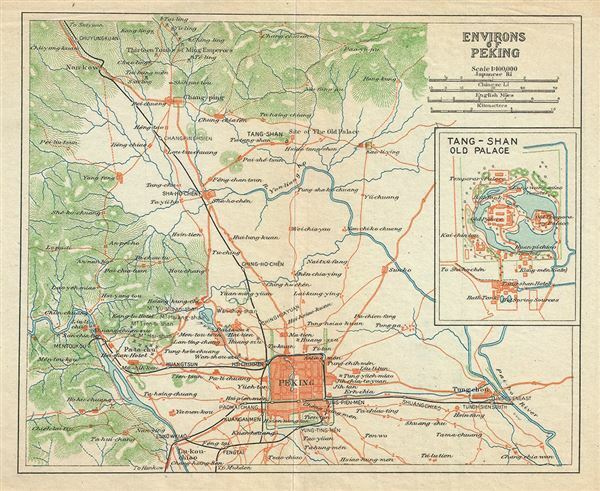 This is a beautiful 1924 railway map of Beijing or Peking and its vicinity by the Imperial Japanese Government Railways. The map depicts Peking, the last of the four great ancient capitals of China, and its surroundings in great detail, towns, rivers, railways, and other topography. Extends from Fengtai north as far as Nankow. An inset of Tang-Shan Old Palace is included along the right border. This map was issued as part of the 1924 Official Series Vol. D of the Guide to China and printed at the Toppan Printing Company.